Juventus boosted their bid for a fifth straight Italian Serie A title by beating fifth-placed Inter Milan with two second-half goals in Turin. Italy defender Leonardo Bonucci fired in a smart far-post volley, shortly after the restart, for the opener. 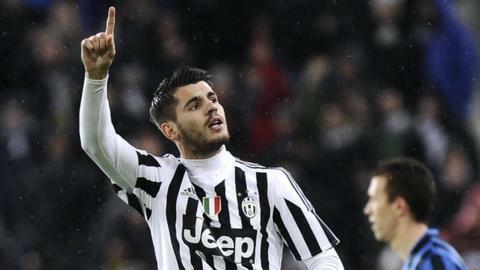 Substitute Alvaro Morata sealed the win by converting a penalty after he was barged over by Inter defender Miranda. Juve moved four points clear of second-placed Napoli, who can reduce the gap at fourth-placed Fiorentina on Monday. Defeat saw Roberto Mancini's inconsistent Inter lose ground in the race to clinch Champions League football next season. With the top three Serie A teams qualifying, the Nerazzurri are four points behind Fiorentina and five adrift of third-placed Roma. Match ends, Juventus 2, Inter Milan 0. Second Half ends, Juventus 2, Inter Milan 0. Attempt missed. Ivan Perisic (Inter Milan) right footed shot from outside the box is just a bit too high. Assisted by Rodrigo Palacio. Corner, Inter Milan. Conceded by Stephan Lichtsteiner. Attempt saved. Éder (Inter Milan) right footed shot from the centre of the box is saved in the bottom right corner. Assisted by Adem Ljajic. Attempt saved. Miranda (Inter Milan) left footed shot from a difficult angle on the left is saved in the top centre of the goal. Attempt saved. Adem Ljajic (Inter Milan) right footed shot from outside the box is saved in the bottom left corner. Adem Ljajic (Inter Milan) wins a free kick in the attacking half. Corner, Juventus. Conceded by Miranda. Substitution, Inter Milan. Éder replaces Mauro Icardi. Goal! Juventus 2, Inter Milan 0. Álvaro Morata (Juventus) converts the penalty with a right footed shot to the top right corner. Penalty Juventus. Álvaro Morata draws a foul in the penalty area. Offside, Juventus. Paul Pogba tries a through ball, but Álvaro Morata is caught offside. Hernanes (Juventus) wins a free kick in the defensive half. Substitution, Inter Milan. Ivan Perisic replaces Alex Telles. Offside, Juventus. Alex Sandro tries a through ball, but Paulo Dybala is caught offside. Delay in match Alex Telles (Inter Milan) because of an injury. Offside, Juventus. Paulo Dybala tries a through ball, but Stephan Lichtsteiner is caught offside. Sami Khedira (Juventus) wins a free kick on the right wing. Attempt missed. Adem Ljajic (Inter Milan) right footed shot from outside the box is close, but misses to the left. Assisted by Alex Telles.